HNMS issues marine forecasts 4 times a day (0400-1000-1600-2200 UTC), which cover the next 24 hours, providing also a 12 hour outlook. 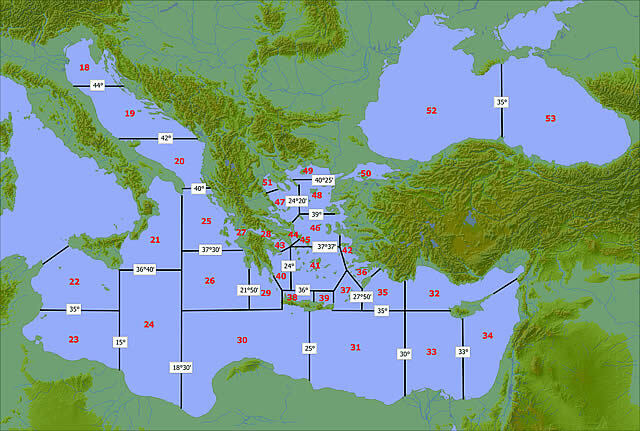 The forecasts are referred to the eastern 36 out 53 sub-areas, Mediterranean and Black Sea, also known as METAREA III, is divided into. General Synopsis for the pressure systems affecting the area and their evolution. Forecast for every sub-area containing Wind Direction and Force (in BEAUFORT scale), Sea (in DOUGLAS scale descriptive terms), Visibility (descriptive terms and when significantly reduced), Weather (when significant). Good: Greater than 5 nautical miles (*not mandatory). GALE WARNING for winds of 8 and 9 bf. STORM WARNING for winds of 10 bf. or higher. Warnings are repeated when there is a significant change in the forecasted parameters.